This week’s page was for One Little Word. The prompt was about music but I decided to do mottos for myself instead. These are all notes to self. 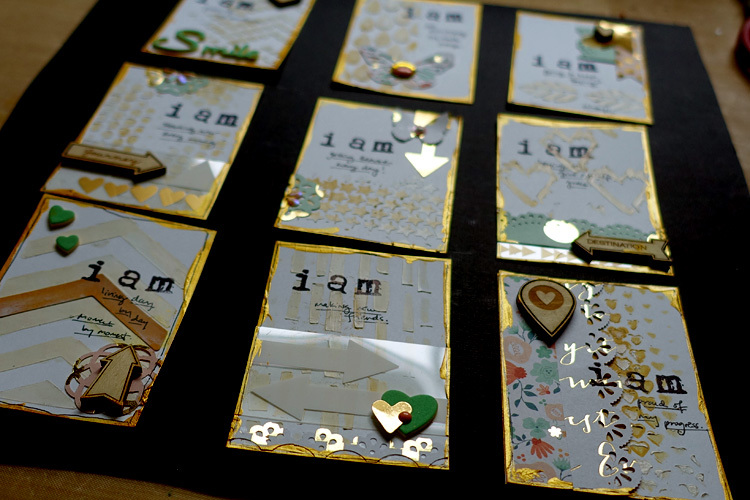 They are things I want to remember and use as mantras for myself. 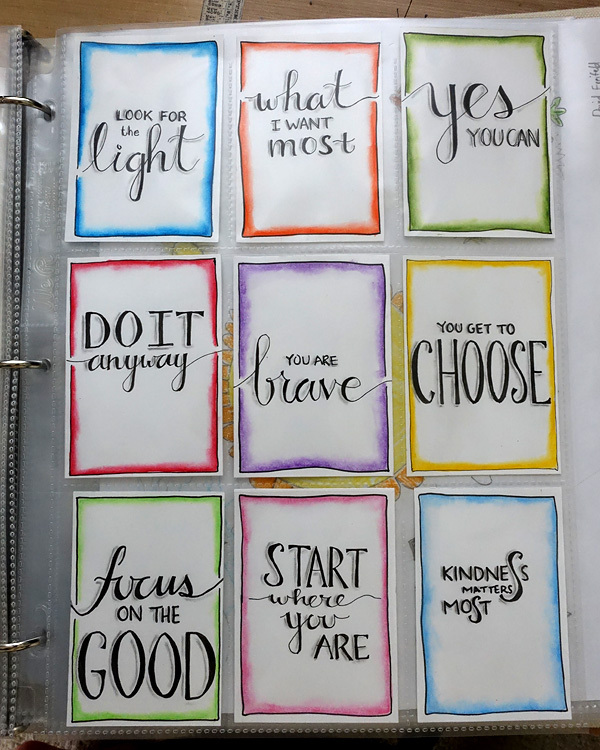 This week’s page was another inspired by a Life Book lesson. But It’s just one I did when I decided I wanted to do something, anything. 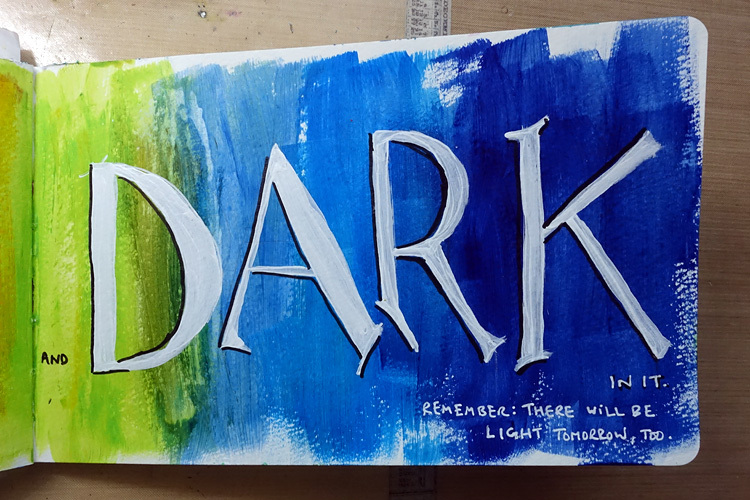 Message says: Everyday has light and dark in it. Remember: there will be light tomorrow, too. 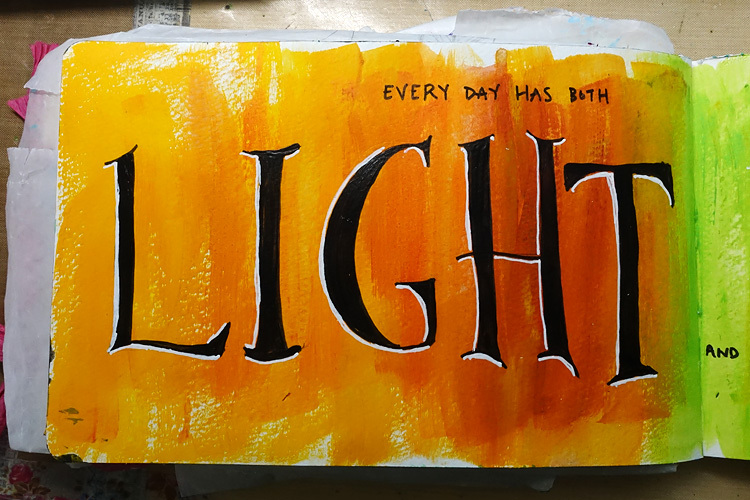 Note to self: i want to remember that there’s light even in the darkest day and dark in the light days. Each day has elements of both. I want to be able to see the light in my dark days and notice that they are there. This is how life becomes magical. In always seeing the light, no matter how small it is. 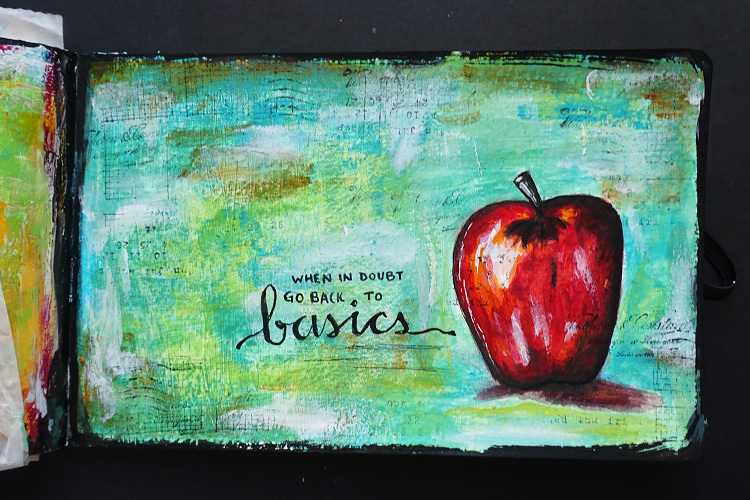 Note to self: if you’re not sure what’s going on or what you want or how you want to proceed, go back to the basics. basics of who you care about, what you stand for, what matters most. Always go back to the basics. This week’s page was another Life Book lesson. One by Alena Hennessy. I didn’t have anything in mind when I started this piece. I just sat down and let myself have fun with paint. 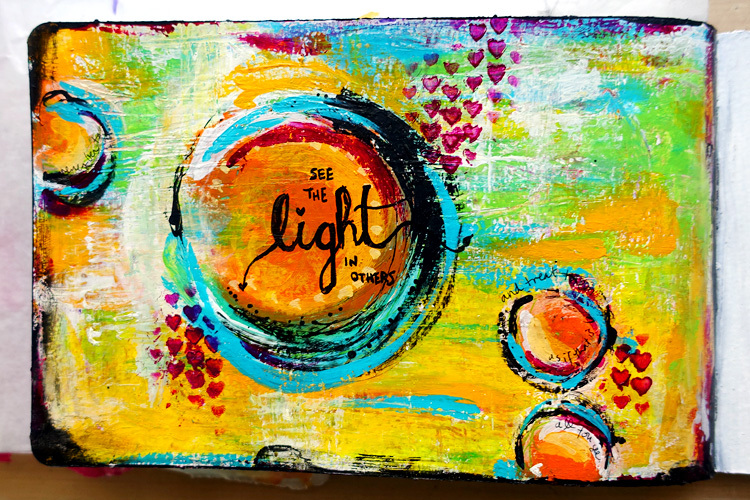 Message says: See the light in others and treat them as if that’s all you see. Note to self: i want to be the kind of person who sees others’ light. everyone has light. i want to be able to find it and hang on to it. just like everyone has pain. if i see their light and i focus on it with all my might, i know the world will be a wonderful place for me. This week’s page was another Life Book lesson. One by Tam. I wanted my girl to be letting her hair loose in the wind. Letting it go. That’s what I always wish for myself. 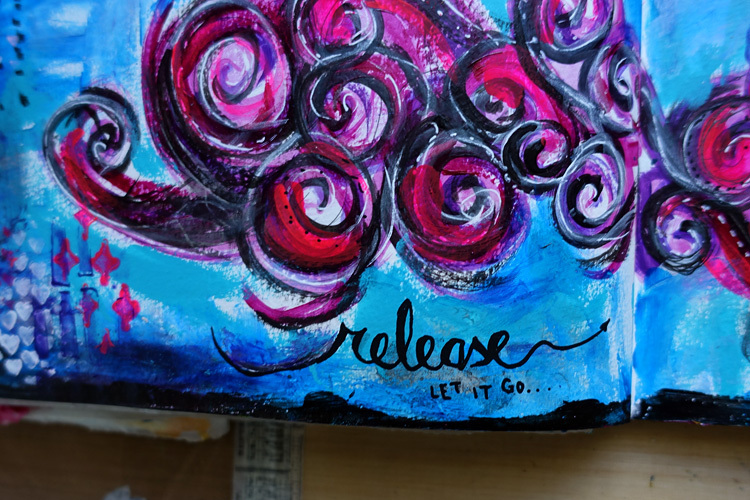 Message says: Release, let it go. Note to self: it is okay to let things go. when you hold so tight, you just hurt yourself. be kind to yourself. it’s ok. put it down. This week’s page was another Life Book lesson. One by Juliet Crane which was about making an owl. I’ve always loved her owls so it was such a privilege to get to make one. 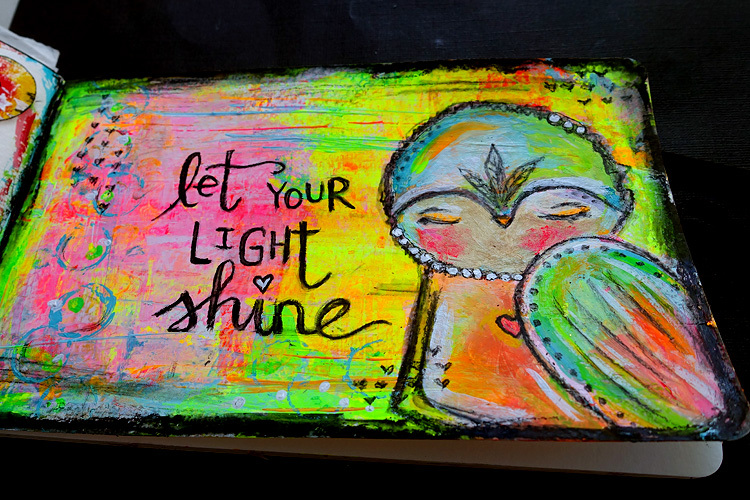 Message says: Let your light shine. Note to self: what makes you who you are is what’s magical about you. Don’t dim that light. don’t be worried about others seeing it. 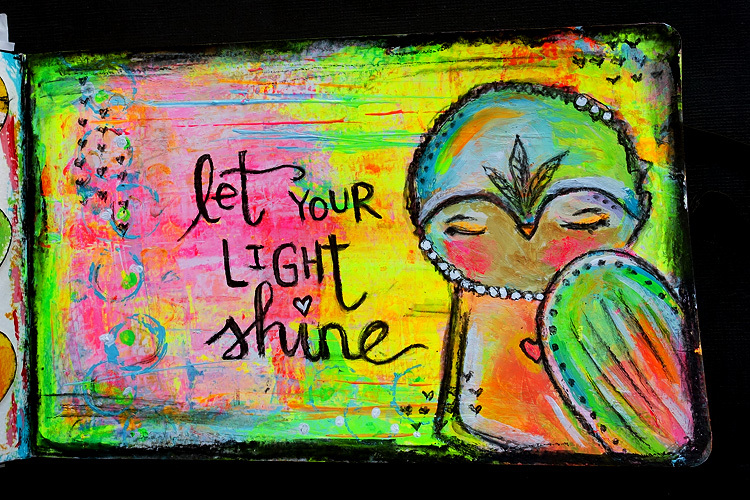 let it shine out with all your might. This week’s page was another Life Book lesson. 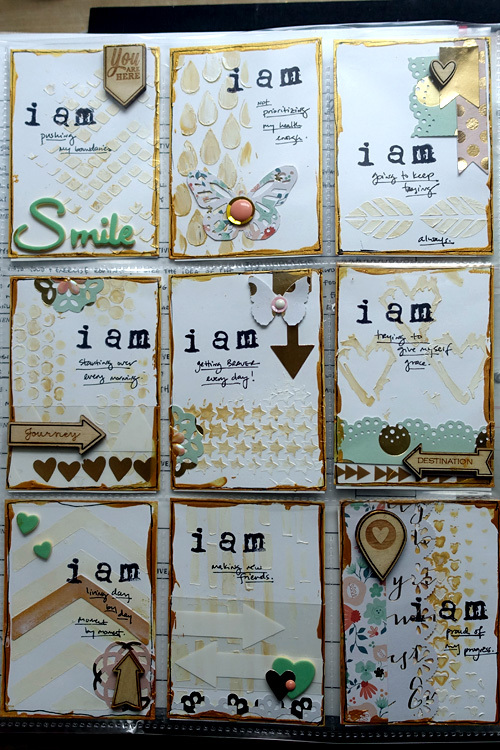 One by Tam and her class was a bit different but I did my own version with my own happy colors. Each of the hearts holds something that feels good to me. Note to self: life is full of magic moments and opportunities. there are a lot of things i love to do. when the tougher times come, it’s good for me to remember those things. they are what make me happy. and they are always here, no matter what. This week’s page was another Life Book lesson. One by Jane Davenport whom I love. 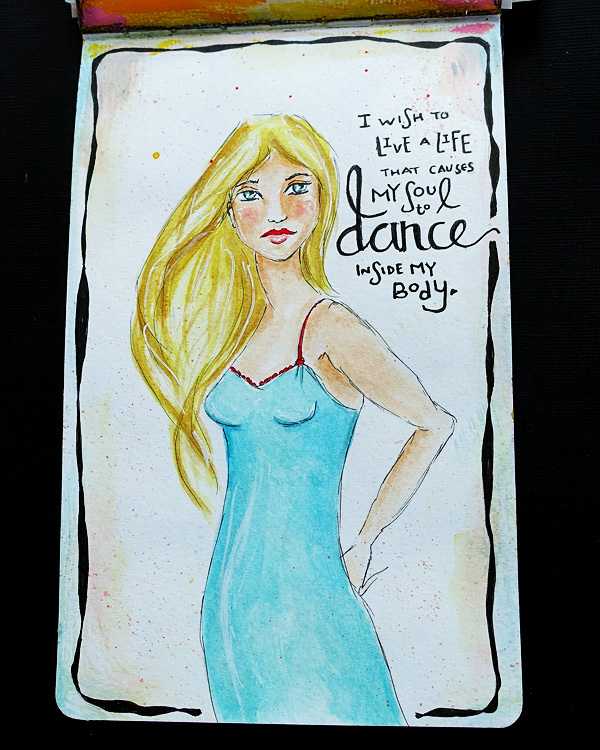 The message on this one says: I wish to live a life that causes my soul to dance inside my body. Note to self: do things that make you come alive. hold on to the joy. Embrace it and don’t let it go. It doesn’t matter what others like or don’t like. what matters is that you honor what makes your soul dance. This week’s page was another Life Book lesson. 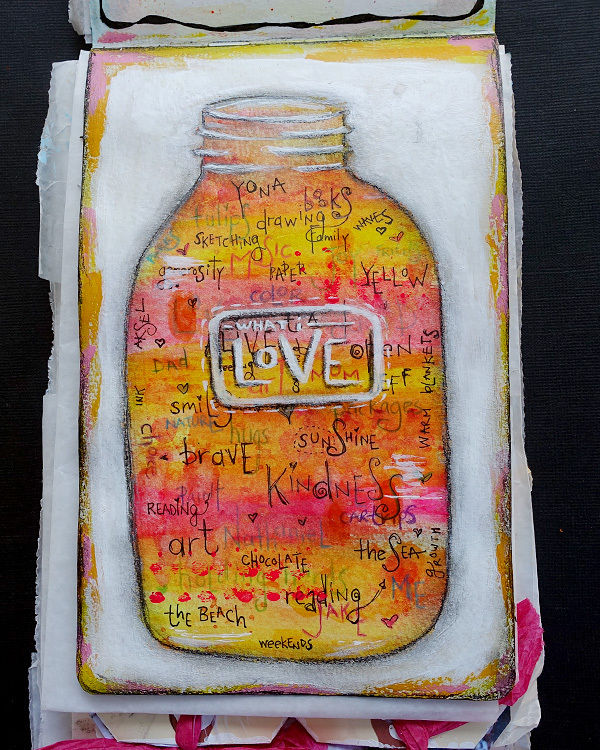 One by Lynn Whipple which was about making a jar with all the things that make you happy. No added message on this one, since there were so many words on it already. Note to self: remember that there are always people, things, thoughts, places, activities that bring you joy at any moment. and even when things are tougher, most of these things are still available to you. 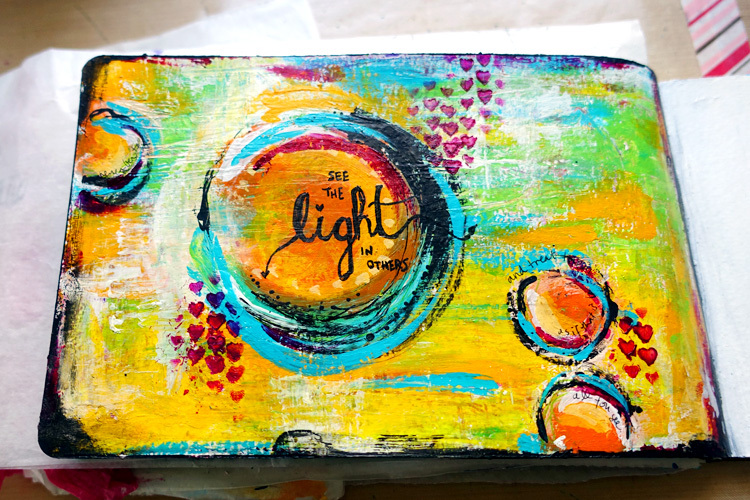 This week’s page takes its inspiration from Mati Rose McDonough’s lesson from Life Book 2015. 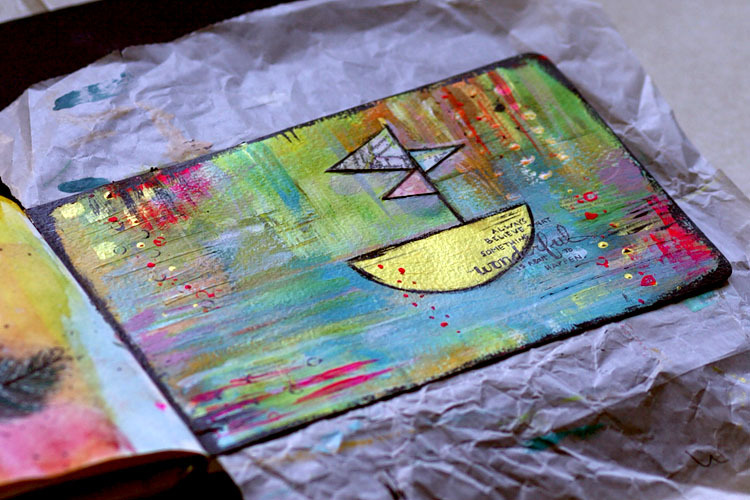 Her little boat made me so happy that I needed to do one myself right away. I loved working on the background of this page. I just played with the colors I loved and didn’t overthink any of the process. That’s generally when magic happens. 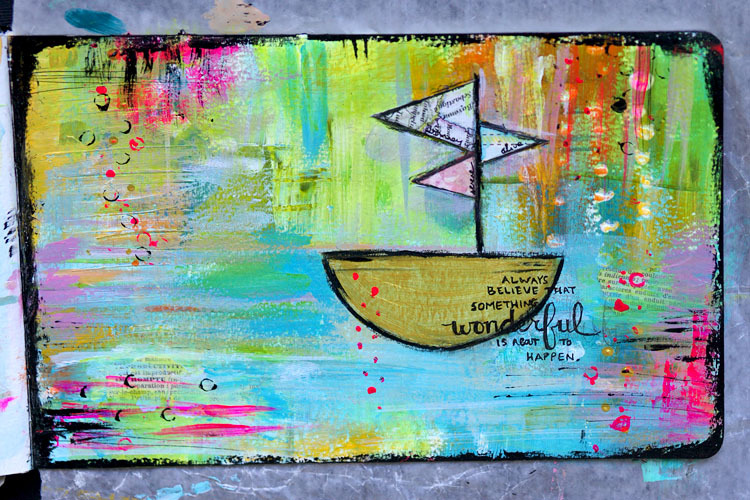 The writing says: always believe that something wonderful is about to happen. This is a perfect quote for someone like me. someone who always worries. Someone who imagines bad things in her head a lot. Someone who isn’t always all that optimistic. I want to change all that. I want to believe in magic and that it’s not only possible but probable in my life. I’ve been so lucky, so incredibly fortunate in my life that I owe it to the universe to honor its wonderfulness. Note to self: be open to the possibility of wonderful. full of wonder. 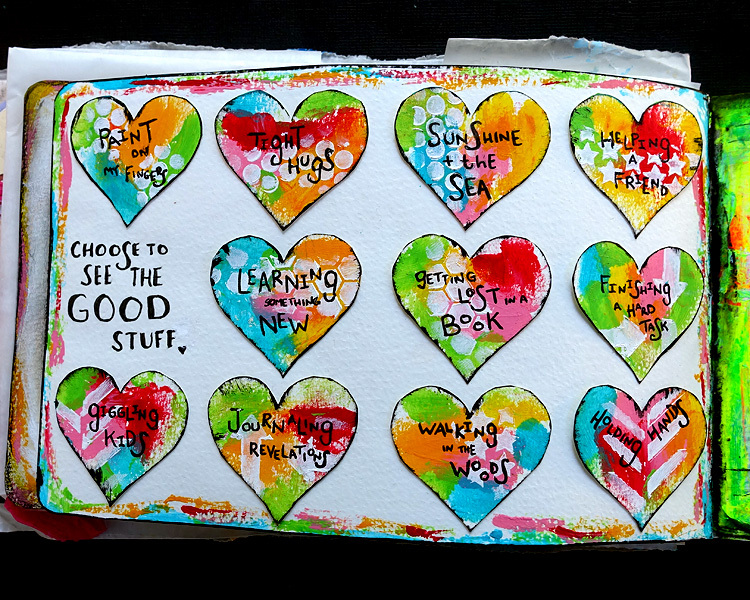 This week’s page is another one of Tam’s beautiful Life Book lessons. She had these wonderful connected shapes but I was doing assignment on Valentine’s Day and thought it might be fun to just use hearts and see how it turned out. I also decided to use some colors I don’t usually use. I will admit, I don’t like how it turned out. I don’t hate it, but it’s nowhere near the top of my favorites list. 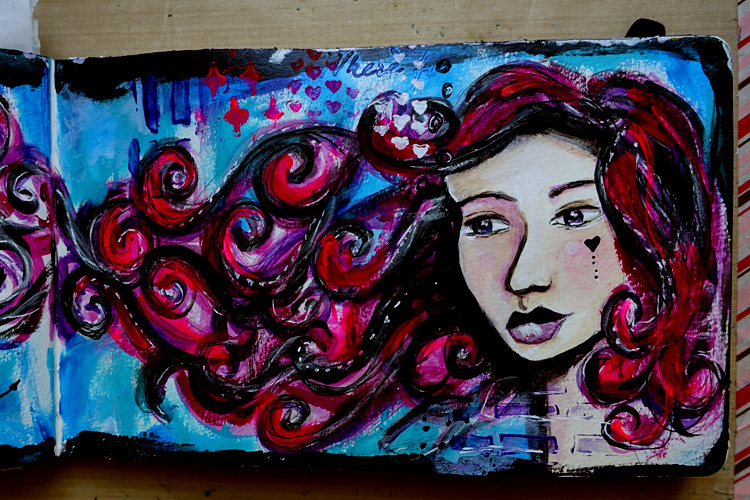 I did love her art and I will have to try this lesson again another time, without the hearts and with different color choices. The writing says: we are all connected through love. I’ve been doing this new practice this year where I just assume someone’s snappy comments are not about me. When they don’t say anything and my natural instinct is to go to my head. To make it all about me. To assume this other person is upset with me. But this year, I am doing the opposite. I am assuming it’s not about me. I am thinking of other possibilities. I am even thinking they want to help me. I am thinking they want the best for me. It allows me to expand and not contract. It allows me to be my best self. It allows me to remember that the world is full of abundance. That we’re all connected and can do more together. Always. Note to self: assume the best of others. assume they want the best for you. they love you. and love them. unconditionally.